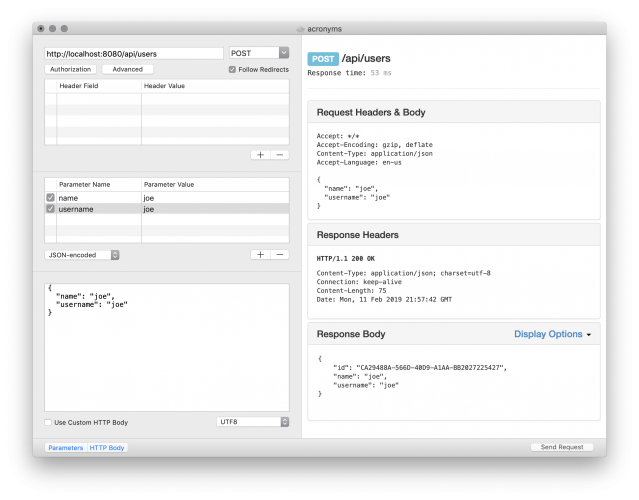 Creating APIs in Vapor and building out an iOS app as the front end may be something you’re fairly familiar with, but you can create nearly any type of client to consume your API. In this tutorial, you’ll create a website-based client against your Vapor API, and along the way you’ll learn how to use Leaf to create dynamic websites in Vapor applications. You’ll use a Vapor app named TIL (Today I Learned) that hosts acronyms entered by users. Note: This tutorial assumes you have some experience with using Vapor to build web apps. See Getting Started with Server-side Swift with Vapor if you’re new to Vapor. You’ll need to at least use the steps in that tutorial to install the Vapor Toolbox in order to follow along with this tutorial. You’ll also need some familiarity with Docker (and have it installed), which you can learn more about in this tutorial. Leaf is Vapor’s templating language. A templating language allows you to pass information to a page so it can generate the final HTML without knowing everything up front. For example, in the TIL application, you don’t know every acronym that users will create when you deploy your application. Templating allows you handle this with ease. Templating languages also allow you to reduce duplication in your webpages. Instead of multiple pages for acronyms, you create a single template and set the properties specific to displaying a particular acronym. 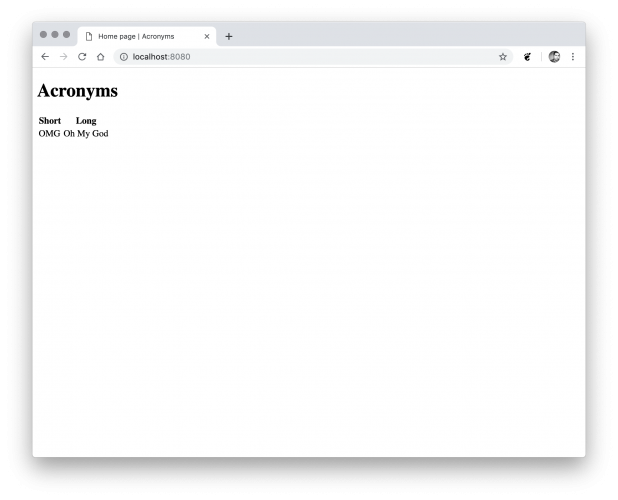 If you decide to change the way you display an acronym, you only need change your code in one place and all acronym pages will show the new format. Finally, templating languages allow you to embed templates into other templates. For example, if you have navigation on your website, you can create a single template that generates the code for your navigation. You embed the navigation template in all templates that need navigation rather than duplicating code. Download the starter project for this tutorial using the “Download Materials” button at the top or bottom of this page. Make the TILApp package depend upon the Leaf package. Make the App target depend upon the Leaf target to ensure it links properly. Declare a new WebsiteController type that conforms to RouteCollection. Implement boot(router:) as required by RouteCollection. Register indexHandler(_:) to process GET requests to the router’s root path, i.e., a request to /. Implement indexHandler(_:) that returns Future. Render the index template and return the result. You’ll learn about req.view() in a moment. Leaf generates a page from a template called index.leaf inside the Resources/Views directory. Declare a basic HTML 5 page with a <head> and <body>. Set the page title to Hello World — this is the title displayed in a browser’s tab. Set the body to be a single <h1> title that says Hello World. Note: You can create your .leaf files using any text editor you choose, including Xcode. If you use Xcode, choose Editor ▸ Syntax Coloring ▸ HTML in order to get proper highlighting of elements and indentation support. Using the generic req.view() to obtain a renderer allows you to switch to different templating engines easily. While this may not be useful when running your application, it’s extremely useful for testing. For example, it allows you to use a test renderer to produce plain text to verify against, rather than parsing HTML output in your test cases. This tells Vapor to use LeafRenderer when asked for a ViewRenderer type. This extracts a parameter called title using the #() Leaf function. Like a lot of Vapor, Leaf uses Codable to handle data. Create an IndexContext containing the desired title. Pass the context to Leaf as the second parameter to render(_:_:). This is an optional array of acronyms; it can be nil as there may be no acronyms in the database. Next, change indexHandler(_:) to get all the acronyms and insert them in the IndexContext. Use a Fluent query to get all the acronyms from the database. You can learn more about Fluent in this tutorial. Add the acronyms to IndexContext if there are any, otherwise set the variable to nil. Leaf can check for nil in the template. Declare a new heading, “Acronyms”. Use Leaf’s #if() tag to see if the acronyms variable is set. #if() can validate variables for nullability, work on booleans or even evaluate expressions. If acronyms is set, create an HTML table. The table has a header row — <thead> — with two columns, Short and Long. Use Leaf’s #for() tag to loop through all the acronyms. This works in a similar way to Swift’s for loop. Create a row for each acronym. Use Leaf’s #() function to extract the variable. Since everything is Encodable, you can use dot notation to access properties on acronyms, just like Swift! If there are no acronyms, print a suitable message. Build and run, then refresh the page in the browser. To test the page with acronyms, you can use the RESTed macOS app to add acronyms into the database, as described in our Fluent tutorial. Once you’ve sent the request to add a new acronym, you can refresh your page in the browser to see acronyms pulled from the database. Declare a new route handler, acronymHandler(_:), that returns Future. Extract the acronym from the request’s parameters and unwrap the result. Get the user for acronym and unwrap the result. Create an AcronymContext that contains the appropriate details and render the page using the acronym.leaf template. Declare an HTML5 page like index.leaf. Set the title to the value that’s passed in. Print the acronym’s short property in an <h1> heading. Print the acronym’s long property in an <h2> heading. This tutorial introduced Leaf and showed you how to start building a dynamic website to consume your Vapor API.